Live Irish, Scottish, folk, country and classic rock music every Sunday from 16:00. On the last Sunday of the month we have an open podium - come along and sing a few songs. Open to everyone - full sound equipment in-house. Een vakantie op Ameland is niet compleet zonder tenminste één bezoek aan hét Pannenkoekhuis. 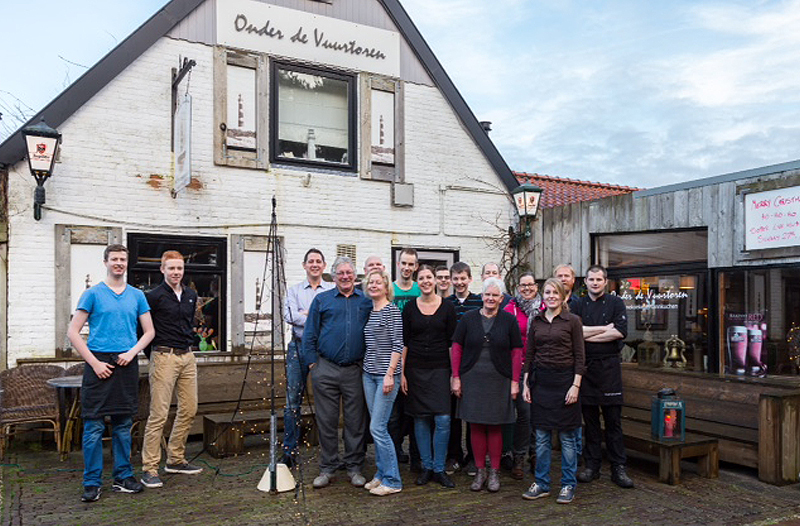 Al meer dan 20 jaar verwelkomt Pannenkoekhuis Onder de Vuurtoren zijn gasten in dit gezellige restaurant. Naast pannenkoeken serveren we ook andere gerechten. Bekijk ons menu voor snacks, vlees- en visgerechten. Zorg ervoor dat u wat ruimte overhoudt voor onze heerlijke desserts! 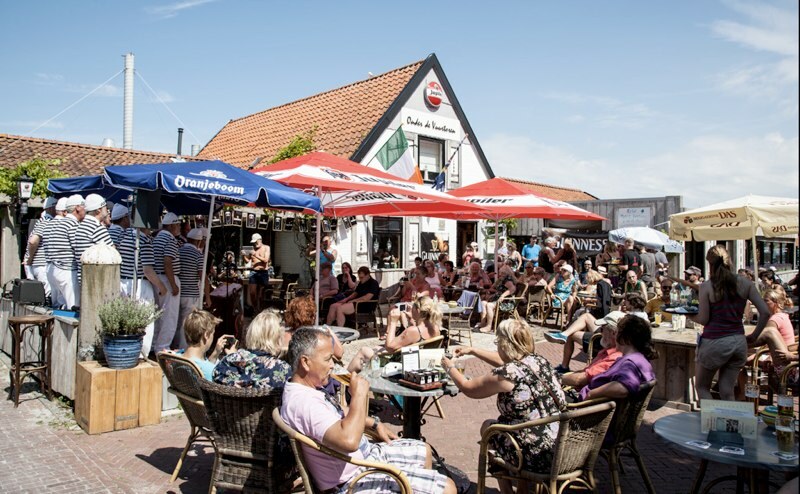 Ons terras is vaak omschreven als één van de leukste op Ameland. In 2015 heeft ons terras de top 3 van gezelligste terrassen van Friesland gehaald. De perfecte plek om te ontspannen met uw favoriete drankje, hapje of pannenkoek na een lange dag op het strand! Ons restaurant is rolstoeltoegangelijk, en voor uw hond hebben we koekjes en water. In 2015 hebben we speeltuin uitgebreid met een springkussen. Groepen zijn van harte welkom, het is dan wel verstandig om te reserveren. Welkom op Ameland en tot ziens in hét pannenkoekhuis! T/m 9 April maandag en dinsdag gesloten. Pannenkoekhuis Onder de Vuurtoren is gedurende de Zomermaanden iedere dag geopend vanaf 11:00. De keuken is geopend van 12:00 tot 20:00. Yes, every Sunday - iedere zondag. 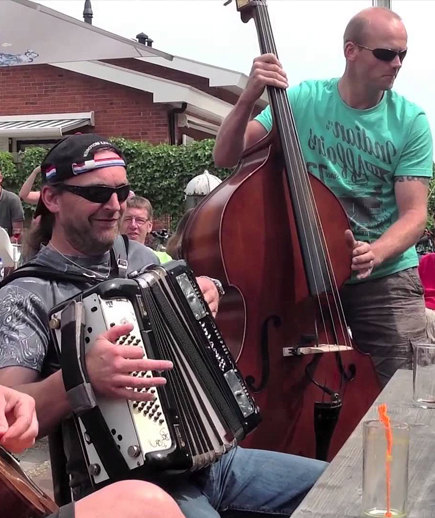 Three of the most sought after ‘guest’ musicians in the country, they have played together and, individually, with many of the top names in Dutch music including Youp van ’t Hek, Douwe Bob, The Amazing Stroopwafels and many more. Izak and Janos are masters of acoustic guitar, 5-string banjo and mandolin and Lucas likewise on the upright bass. Their repertoire includes a wide range of acoustic styles including bluegrass and Celtic and they perform these songs both in Dutch and English. Great to welcome Marjolein and her boys back to Ameland. They have been very busy with their Theatre shows and many other projects. Marjolein will present some of her own vast repertoire and, lucky me, I get to join them for a good old Twangmen reunion. Yet another musical Kuipers!! Onno and his lovely wife, Mariette, often perform together and present a beautiful collection of Celtic tunes and songs on accordions and guitar. I suspect that some of the other musicians may want to join in. We welcome Claddagh back again. The members are all part of Ameland’s Canita Tuba brass band and regularly perform as an ‘Irish’ quintet during the entr’acte. It’s wonderful to see that Irish music is alive and well on the islands. They played for the first time in 1990 and have been have been honing their craft ever since. Today they travel quite a lot through Europe to perform at many festivals.I can’t wait to see them marching down the road in full attire with the sensational sound of the pipes and drums preceding them. You couldn’t have a Celtic Festival on Ameland without Jock - our good friend and star of stage and screen. Jock and Paul are well known to the Pannekoekhuis faithful and will delight you with their wide repertoire of songs and tunes. Luckily for us, Jock has some free time from his ‘Outlander’ filming. The famous session on the terrace. Join in or relax and enjoy. 17:30 - Paul, Jock and whoever wants to join them onstage!! Flora Inn, Bathmen / Gorssel - de mooiste bloemenzaken in Nederland! !